Zeuhl! My fave type of French music; especially when there’s no vocals. This cd is from Francois Thollot (guitar, piano) and he’s joined by Philippe Busssonnet (Magma, One Shot) on bass and Daniel Jeandheur (One Shot) on drums. While Zeuhl tends to be very intense music, I found Thollot to be quite smooth and easy to listen to, almost like a Zeuhl light. Francois wrote all the music and did the arrangements. There are not a lot of noticeable overdubs, so it’s a very clean sound. The songs are typical for Zeuhl: aggressive and intense, almost jerky. There’s great playing from everyone and no one stands out. I know it’s supposed to be a Francois solo, but he seems to have written it with a band in mind. I particularly liked this piece. Mostly I’m a big fan of no-vocal music. I also like selected bands in the Zeuhl catalog. Unfortunately, some of them are way too intense or too weird for me. What I like about Thollot is the accessibility. It’s top drawer playing, filled with odd arrangements, a bit aggressive here and there, and it has a lot of heart. For more information you can visit the Soleil Zeuhl web site at: http://www.chez.com/soleilzeuhlrecords/eng/thollot-gb.html. Email Soleil Zeuhl at: soleilzeuhl@aol.com. 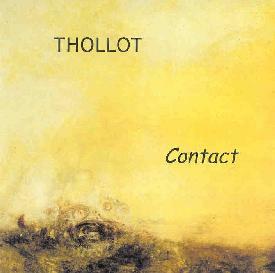 Contact via snail mail c/o Soleil Zeuhl; c/o Alain Lebon Productions; 3 Rue de la Lancette; 75012 Paris; France.